Most people don’t think about their garden after everything is harvested and cleaned up for the year—it just sits there, waiting for spring. However, your garden should actually be growing something this time of year, even if you do live in a colder climate like Wisconsin. If your garden isn’t growing something, there is a good chance that you’ll lose some of your soil to erosion. I know that there are a lot of methods that can help, such as not tilling your garden, but the presence of a live root system holding the soil in place is a really tough act to follow. Our garden currently has winter rye planted in it. Don’t confuse winter rye, the cereal, with perennial rye, the grass. Believe it or not, the winter rye will remain alive throughout the winter. I keep an eye on our winter rye (at least, until the snow flies), which is currently doing quite well. It probably looks a bit sparse here, but this concentration of winter rye is more than sufficient. I plan to wait until the winter rye is about 12 inches tall in the spring, and then till it into the soil. Of course, this process seems a bit odd to anyone who doesn’t realize what I’m doing. Planting winter rye (or another ground cover like it) has some significant benefits and presents few problems. The ground cover keeps erosion at bay. Winter rye fixes nitrogen that will be released as the plant decomposes. There are fewer weeds because the winter rye shades it out. You can plant earlier because the winter rye soaks up excess water in the garden. 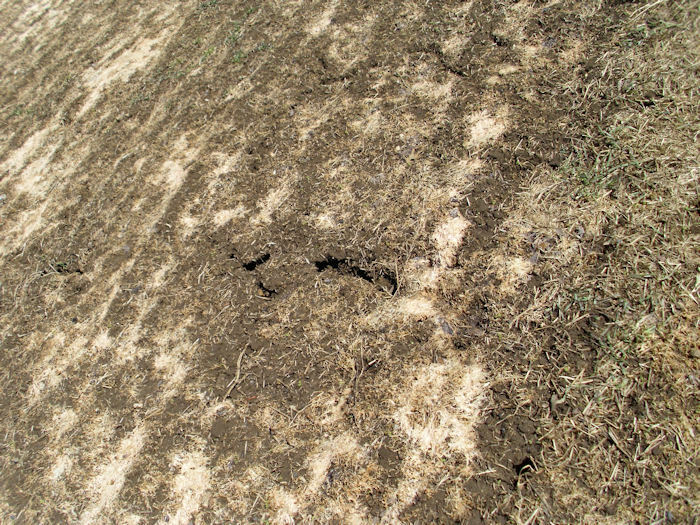 The tilled-in plants act as a natural fertilizer, which reduces your costs. The biggest problem with winter rye is letting it get too big. 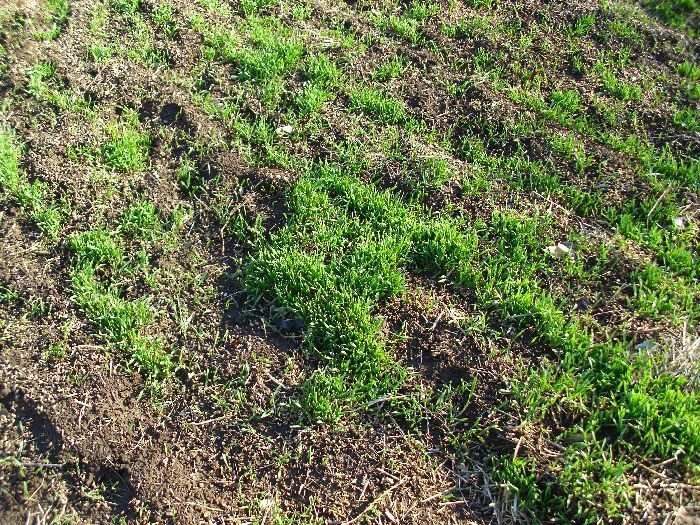 You’ll have to work with winter rye for a while to know precisely when to till it in, but if you let it get too big, winter rye can quickly turn into a frustrating mess. The best advice I can provide is to mow the winter rye down and then till several times. Be prepared to work really hard with the tiller because once the roots grow to a certain size, they don’t till very easily. We only let it grow too big one time—the result was enough to ensure we didn’t let it grow too large ever again. For now, the winter rye is doing its job of keeping the soil in place. The snow will fly soon (as early as tomorrow) and I’ll lose sight of it until next spring. When the snow melts, the winter rye will still be there doing its work. I’ll till it into the garden and then plant our vegetables. The results will be great. This particular change in my gardening technique was easy because the results are so good. This year we are trying something new. Part of our small garden is planted in spinach. From what I’ve been told, the spinach will sprout extremely early next spring and be ready to pick long before I even have anything else planted. So, we’ll be having salads long before anyone else has even thought about planting their gardens. I’ll be sure to let you know how it works out. One word of advice here. If you do decide to plant spinach, it doesn’t appear to act as a ground cover. You want to plant the spinach up hill of the winter rye so that the winter rye can still control any erosion. We planted our spinach in thin strips so that we could get to it easily, but the erosion wouldn’t be a problem. That’s one of the fun parts about gardening—trying different things out to see how they work. Let me know if you have any questions at John@JohnMuellerBooks.com. The ground cover holds the soil in place and reduces erosion. It fixes nitrogen all winter long and acts as “green manure” when we till it in later in the spring. Having something planted in the garden shades out the weeds, so we aren’t fighting the weeds as much. Winter rye drinks up the excess moisture, so we can get into the garden earlier (without sinking up to our knees in mud). There are probably other reasons for growing winter rye, but these four are the reasons we take time to plant it. Unfortunately, we had an early frost this last fall. So, the winter rye sprouted, but didn’t have time to establish itself before the frost hit. As a result, unknown to us, the winter rye died. So our garden is unprotected this spring and I’m already seeing evidence of erosion as shown here. There isn’t any time to plant more winter rye now. So, we’ll control the erosion in another way, by placing hay bails on the downward side of the garden slope. Using the hay bails will slow the water flow and at least keep the soil in the garden. Of course, the point is that nature doesn’t always cooperate with our plans, so it’s important to have a Plan B (the hay bails in this case). The hay won’t go to waste. Later this spring, when everything is planted, we’ll use the hay to mulch the garden. Mulching reduces the need to water and keeps weeds under control, but more on that later. So, what do you do to control erosion and keep weeds under control in your garden? Let me know at John@JohnMuellerBooks.com.